Most businesses still operate according to a world view that hasn't changed since the start of the Industrial Revolution. Then, natural resources were abundant and labor was the limiting factor of production. But now, there's a surplus of people, while natural capital natural resources and the ecological systems that provide vital life-support services is scarce and relatively expensive. In this groundbreaking blueprint for a new economy, three leading business visionaries explain how the world is on the verge of a new industrial revolution. 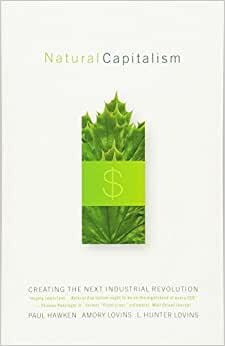 Natural Capitalism describes a future in which business and environmental interests increasingly overlap, and in which companies can improve their bottom lines, help solve environmental problems and feel better about what they do all at the same time. Citing hundreds of compelling stories from a wide array of sectors, the book shows how to realize benefits both for today's shareholders and for future generations and how, by firing the unproductive tons, gallons, and kilowatt-hours it's possible to keep the people who will foster the innovation that drives future improvement. This book has some excellent concepts on a macro scale but the author really misses some important details making some of the ideas ‘fanciful’. For instance, the author dedicated the better part of a chapter to hydrogen powered cars but never mentions the amount of energy necessary to split hydrogen from water. This seemingly minor fundamentally undermines the feasibility of the first chapter of the book. I am all for alternative fuels but I am also an engineer whom has an appreciation for what is and is not a viable approach. Since this book was published, electric cars have made huge technological advancements because of their overall energy efficiency and use of the existing electric grid for charging. Electric cars can also be charged from solar panels on your home. In any case, the author didn’t do enough homework on some of these concepts and arbitrary attempted to pick winning and losing technologies. The overall concept portrayed is great but the pages dedicated to impractical alternatives detracts significantly from the authors theme. Most responses to political and social problems fall into two broad categories: libertarian/populist and authoritarian/statist. And too often, "leftist" critiques of capitalism fall into the latter category, crying "market failure" and calling for central control by government regulation. One tremendous strength of their approach is their avoidance of a very common error. Too many critics of eco-stupidity and corporate irresponsibility take themselves to be critics of the "free market" as such, failing to realize that their proposed solutions are, in an economic sense, just as "capitalistic" as (if not more so than) the problems. What they propose to replace "capitalism" by is, in fact, just capitalism again, but populated by people with better values. Well, these folks know that's exactly what they're doing, and what they propose is in effect the best general response to cries of "market failure". In a strictly economic sense, every "market failure" really represents a place that the "market" hasn't reached yet. Under the Hawken/Lovins proposal, "markets" work just fine if they take account of _all_ relevant costs. Economically, what they're saying is that (e.g.) polluters have to _internalize_ the costs of pollution. Is there a libertarian out there who would disagree in principle? Oh, we could pick nits about the details. The point, though, is that Hawkens and the Lovinses are presenting here a vision of the "free market" as what economists have always said it was: an organic, emergent, genuinely interdependent network of centers of genuinely voluntary activity by fully informed and self-responsible actors. And the resulting society looks like hippies have always said it should: less like the military-industrial complex and more like a Grateful Dead concert ;-). If Aquarian libertarianism is (as Mary Ruwart says) the key to "healing our world", then the sort of green eco-capitalism represented here is a pretty sound prescription for that healing. The Dream isn't dead, and it isn't economically irresponsible either. 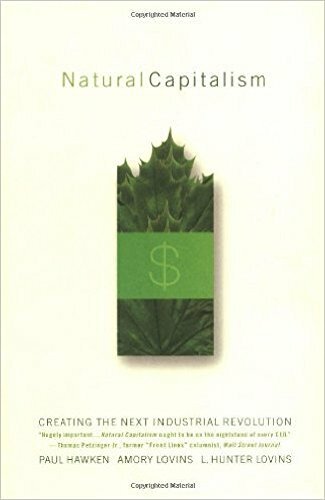 Paul Hawken and the Lovins have teamed up to provide one of the best overall books on "Natural Capitalism" which offers a whole new approach to the way in which we do business. For too long we have taken natural capital for granted, squandering our natural resources and unleashing an unhealthy array of by-products which have further contaminated our world. It is time to add natural capital to the ledger sheets, properly balancing our record books. But, far from being a screed the book is meticulously researched with extensive notes and references to help guide your own research into the subject. Everything from the Toyota Production System, which offered a leaner, much less wasteful approach to auto manufacturing, to the Hypercar which offers a hybrid-electric propulsion engine which would result in much greater fuel effeciency are illustrated. It is this lean thinking which the authors think will revolutionize the industrial sector, making for the greatest breakthroughs since the microchip revolution. What is most heartening is that major companies such as Ford Motor Company and Carrier Air Conditioning are adopting these practices and making them work. They are doing so because it saves money and provides them with endless growth possibilities. The authors support the lease-use system which puts the onus on the manufacturer to produce better products and maintain them throughout their service to the user, the so called "cradle to cradle" concept. New materials are resulting in much lighter and more efficient components that would reduce our dependency on foreign oil, and in time phase out petroleum products all together. Too good to be true you might say, but this is the shape of things to come once we get past the tired old dogmas that have greatly limited our economic potential. The authors show how regressive tax policies and federal subsidies have greatly handicapped our productivity and they encourage political leaders to rethink the way we hand out incentives for better business practice. This book will give you a whole new lease on life, and encourage you to rethink the way you live.